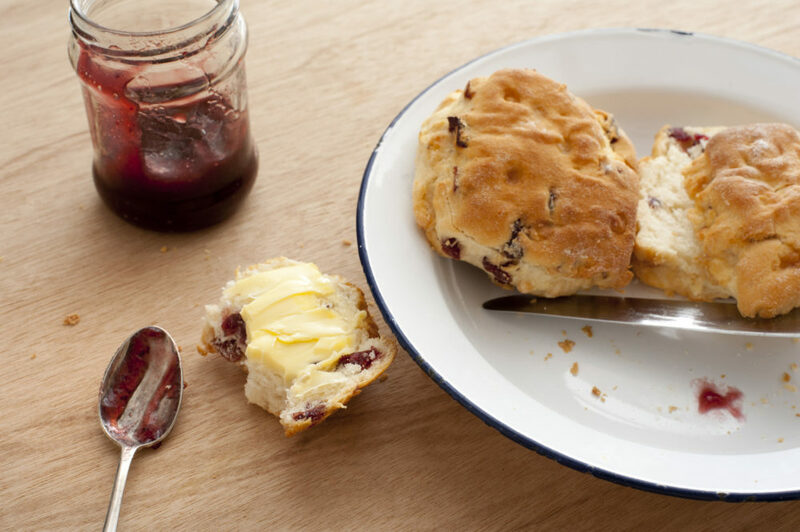 These delicious fruit scones are the perfect afternoon treat – particularly good on a Sunday! Preheat the oven to 240 ⁰C, gas Mark 9 and prepare baking tray line with baking paper or dust baking tray with flour. Sieve all dry ingredients into a bowl, rub butter into the flour with your finger- tips until the mixture resembles fine bread crumbs. Add sultanas. Beat the eggs with the milk and add to the flour mixture and combine all ingredients until they come together. Remove from mixing bowl. Place on a floured work surface and knead dough lightly and shape into a round. Roll out to 3cm thick. Using scone cutter cut out scones and place on baking tray allowing space between each scone. Bake in oven for 10 to 12 minutes until golden brown. Remove from oven and place scones on wire tray to cool. Enjoy with jam and cream.